What if you were one secret away from living a life of effortless abundance...here's your chance to discover the "missing pieces" that took me 22 years to figure out... so that you too can finally start experiencing true abundance - in all areas of your life... without investing anymore hard work, education, experience, or even capital! Without this vital missing piece, all your hard work could go to waste... all your education and experience could still keep you stuck... and all of your hard-earned money could be lost! Don't get me wrong, I learned a lot from many of those products... and I even saw some great results from some of them. But, they were all missing something. And, most of the results I got from them didn't last. And, all the while, the biggest and most powerful secret of them all - the missing piece that would make all of those other pieces finally make sense, and open up the floodgates of abundance - was right under my nose. Until, finally... one night as I lay in bed - exhausted from several hours of analyzing and questioning all of the stuff I had learned over the years... the answer finally came to me...! But hey... it doesn't have to take you that long to figure it out. Because after I finally "got" it, I decided to share this simple yet elusive secret - to true and lasting abundance - with everyone that I could. 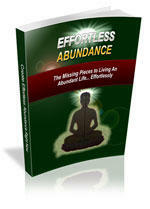 I have put together a short report - barely 25 pages long - that reveals the effortless abundance secrets that I've discovered for myself.